Your wagashis are always so beautiful, perfect eye candy! Thank you for posting them. I love chrysanthemums. I remember the last time I was in japan years ago my aunt took me to the temple where there was a huge exhibit of chrysanthemums in the fall. My father's friend who has a Japanese restaurant in Chicago used to use the leaves in tempura - I really liked that. That seems hard to find. Yeah, those chrysanthemum exhibits are always so fabulous. I’ve been to one in Kyoto, and it was just amazing. BTW, I didn’t know that chrysanthemum leaves were edible! But I can imagine they can be good as tempura… just like shungiku tempura… or maybe stronger-tasting than shungiku??? Thanks for sharing. I had no idea wagashi came in so many different forms. Are fish cake shapes as variable? You have the best blog, but it always makes me so hungry! how beautiful! 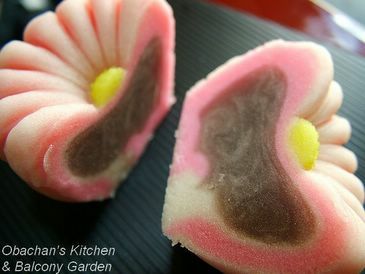 i didn't know about wagashi, but i am going to find what it is thanks to the internet! Oh, they do. And I’m just showing one tiny part of it. 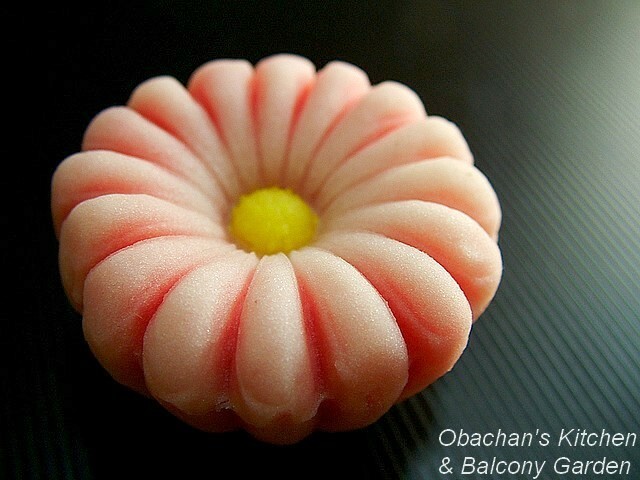 Fish cakes come in many different forms, too, but I guess not as much as wagashi do. Kirei desho? 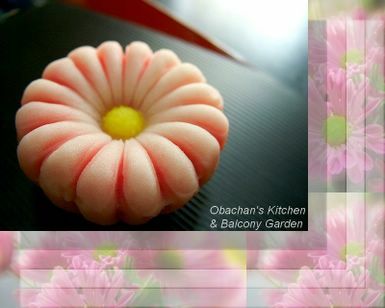 This wagashi tasted good -- so smooth and silky. Actually it is a small wooden spatula that they use to make these cuts. Oh, are you talking about the last photo?